Nice, and he is indeed a walking gaff waiting to go off. We're told the standing thought is that the World waits with baited breath and electrified legs to hear OBAMA speak; yet it seems the Pundit Class are all waiting eagerly to hear something in the Classic Biden genre. What do the experts know? ( Yes, that's rhetorical. ) Is Dan Quayle's redemption imminent? Plugalicious!! But let's not be too hasty deriding the folliclely impaired. I say make yourself happy installing a more verile look.....just do it so people won't giggle. John, that can't be Joe Biden. His mouth is closed. I can't imagine many Dem VP picks that would have been worse. Biden's "misery factor" is right up there with Michael Dukakis. VEEP candidate for a day, & he has a "Mark Furhman" moment. He might as well have called him "well-spoken." I believe that storybook would be Uncle Joe's Cabin. African-American/Black folks of the world, pay careful attention; this is what [white] Democrats think of you. I was kinda hoping that Barry would have picked Michael Dukakis as his VP. Don't you think Biden is close enough? All the misery, twice the bravado (at least). I can hardly wait until they start rolling out some of his "classic" footage from Senate hearings & "inquests". 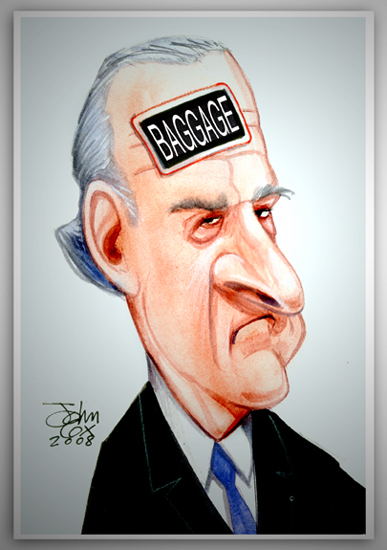 Just like flying on American Airlines, Obama will have to pay for his baggage. This page contains a single entry from the blog posted on August 25, 2008 12:42 AM. The next post in this blog is RIDGELINE.